The origin of the Hebrew drama may be traced back to a very early period. The ancient Hebrews, like other nations of antiquity, were wont to express their emotions in the form of dialogue interspersed with songs. Miriam, with a drum in her hand, singing the deliverance of Israel, while the other women answer her in chorus, suggests vividly the strophes and antistrophes of the later Greek. The song of Moses is of the same nature. The Song of Solomon, according to many scholars, is a regular drama, the heroine of which is the Shulamite, and in which the other dramatis personæ are: Solomon; a shepherd; chorus; watchmen, etc. (see Renan's translation of the Song of Solomon). To the foregoing may be added the Book of Job, which, if not so elaborate in dramatic form as the Canticles, yet represents several persons as acting, namely: Job; his wife; the messengers; Eliphaz, Bildad, and Zophar (Job's three friends); Elihu; and God. These few crude dramas of the Biblical epoch had no immediate successors. Till the seventeenth century C.E. not a single drama in Hebrew is known. It is true that in the second century B.C. Ezekiel the Alexandrian, inspired by Euripides, wrote a drama in Greek, "The Exodus"; but other Jews did not imitate him. With the fall of pagan Rome a new era of culture began, in which the Jews actively participated, producing a considerable quantity of dramatic literature, though written in secular languages (Kayserling, "Sephardim; Romanische Poesien der Juden in Spanien"). It was the city of Amsterdam, where the Jews found freedom from persecution, and where Jewish libraries and literary societies existed, that gave birth to the modern Hebrew drama. The subject may be divided into: (1) dramas written in Hebrew; and (2) those translated or adapted into Hebrew from other languages. Of the former the earliest were written about the middle of the seventeenth century, and the production of their successors continued with some interruption for about two hundred years. Translations began to be made at the end of the eighteenth century, but reached their highest excellence at the end of the nineteenth century. The translation into Hebrew of dramas written in other languages is still carried on with great activity. I. Of the dramas written in Hebrew the oldest is ' ("The Eternal Foudation"), written by Moses Zacuto at Amsterdam about 1642 (Franz Delitzsch, "Gesch. der Jüdischen Poesie," p. 75). The subject is the legend that Abraham destroyed the idols of his father, leaving only the large one. On being brought by his father before Nimrod, he is sentenced to be thrown with his brother Haran into a fiery furnace. Haran perishes in the flames, but Abraham is rescued by an angel. The style is very fluent and agreeable. Sometimes the author gives to Hebrew roots forms which are not found in the Bible. The long pieces have one and the same rime, a system common in Arabic poetry. In the short pieces, as in the Persian "mesnevi," the two hemistichs usually rime together. The drama was published by Berliner, with an introduction, at Breslau, 1872, and by David J. Maroni at Leghorn in the same year. ("The Prisoners of Hope"), by Joseph b. Isaac Penso, 1667, was printed at Amsterdam in 1673. The argument is as follows: A king who takes a serious view of his responsibilities is led astray, now by his own impulses ("yeẓer"), now by his wife ("ishshah"), and now by Satan. Finally his own understanding ("sekel"), Providence ("hashgaḥah"), and an angel endeavor to lead him in the right way.The author was only seventeen years old when he composed the work, which was somewhat beyond his powers, although several poets have praised in verse the talent of the young dramatist.The aim of both Penzo and Zacuto was to direct the attention of the Maranos to the Hebrew language and to draw them away from profane literature, to which they had exclusively devoted themselves.During the seventy years which followed no Hebrew drama appeared. Some insignificant farces were written in Judæo-Spanish and afterward burned, but it was not till the first half of the eighteenth century that a revival of the Hebrew drama took place. 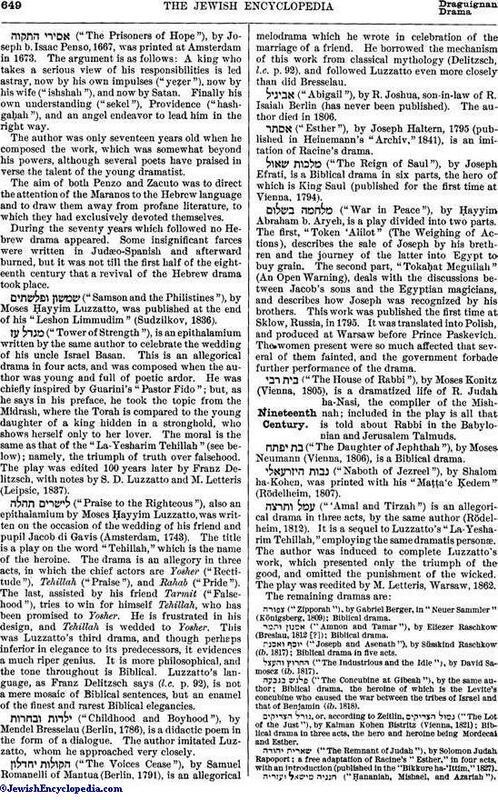 ("Samson and the Philistines"), by Moses Ḥayyim Luzzatto, was published at the end of his "Leshon Limmudim" (Sudzilkov, 1836). ("Tower of Strength"), is an epithalamium written by the same author to celebrate the wedding of his uncle Israel Basan. This is an allegorical drama in four acts, and was composed when the author was young and full of poetic ardor. He was chiefly inspired by Guarini's "Pastor Fido"; but, as he says in his preface, he took the topic from the Midrash, where the Torah is compared to the young daughter of a king hidden in a stronghold, who shows herself only to her lover. The moral is the same as that of the "La-Yesharim Tehillah" (see below); namely, the triumph of truth over falsehood. The play was edited 100 years later by Franz Delitzsch, with notes by S. D. Luzzatto and M. Letteris (Leipsic, 1837). ("Praise to the Righteous"), also an epithalamium by Moses Ḥayyim Luzzatto, was written on the occasion of the wedding of his friend and pupil Jacob di Gavis (Amsterdam, 1743). The title is a play on the word "Tehillah," which is the name of the heroine. The drama is an allegory in three acts, in which the chief actors are Yosher ("Rectitude"), Tehillah ("Praise"), and Rahab ("Pride") The last, assisted by his friend Tarmit ("Falsehood"), tries to win for himself Tehillah, who has been promised to Yosher. He is frustrated in his design, and Tehillah is wedded to Yosher. This was Luzzatto's third drama, and though perhaps inferior in elegance to its predecessors, it evidences a much riper genius. It is more philosophical, and the tone throughout is Biblical. Luzzatto's language, as Franz Delitzsch says (l.c. p. 92), is not a mere mosaic of Biblical sentences, but an enamel of the finest and rarest Biblical elegancies. ("Childhood and Boyhood"), by Mendel Bresselau (Berlin, 1786), is a didactic poem in the form of a dialogue. The author imitated Luzzatto, whom he approached very closely. ("The Voices Cease"), by Samuel Romanelli of Mantua (Berlin, 1791), is an allegorical melodrama which he wrote in celebration of the marriage of a friend. He borrowed the mechanism of this work from classical mythology (Delitzsch, l.c. p. 92), and followed Luzzatto even more closely than did Bresselau. ("Abigail"), by R. Joshua, son-in-law of R. Isaiah Berlin (has never been published). The author died in 1806. ("Esther"), by Joseph Haltern, 1795 (published in Heinemann's "Archiv," 1841), is an imitation of Racine's drama. ("The Reign of Saul"), by Joseph Efrati, is a Biblical drama in six parts, the hero of which is King Saul (published for the first time at Vienna, 1794). ("War in Peace"), by Ḥayyim Abraham b. Aryeh, is a play divided into two parts. The first, "Token 'Alilot" (The Weighing of Actions), describes the sale of Joseph by his brethren and the journey of the latter into Egypt to buy grain. The second part, "Tokaḥat Megullah" (An Open Warning), deals with the discussions between Jacob's sons and the Egyptian magicians, and describes how Joseph was recognized by his brothers. This work was published the first time at Sklow, Russia, in 1795. It was translated into Polish, and produced at Warsaw before Prince Paskevich. The women present were so much affected that several of them fainted, and the government forbade-further performance of the drama. ("The House of Rabbi"), by Moses Konitz (Vienna, 1805), is a dramatized life of R. Judah ha-Nasi, the compiler of the Mishnah; included in the play is all that is told about Rabbi in the Babylonian and Jerusalem Talmuds. ("The Daughter of Jephthah"), by Moses Neumann (Vienna, 1806), is a Biblical drama. ("Naboth of Jezreel"), by Shalom ha-Kohen, was printed with his "Maṭṭa'e Ḳedem" (Rödelheim, 1807). ("'Amal and Tirzah") is an allegorical drama in three acts, by the same author (Rödelheim, 1812). It is a sequel to Luzzatto's "La-Yesharim Tehillah," employing the same dramatis personæ. The author was induced to complete Luzzatto's work, which presented only the triumph of the good, and omitted the punishment of the wicked. The play was reedited by M. Letteris, Warsaw, 1862.The remaining dramas are: ("Zipporah"), by Gabriel Berger, in "Neuer Sammler" (Königsberg, 1809); Biblical drama. ("Amnon and Tamar"), by Eliezer Raschkow (Breslau, 1812 [? ]); Biblical drama. ("Joseph and Asenath"), by Süsskind Raschkow (ib. 1817); Biblical drama in five acts. ("The Industrious and the Idle"), by David Samoscz (ib. 1817). ("The Concubine at Gibeah"), by the same author; Biblical drama, the heroine of which is the Levite's concubine who caused the war between the tribes of Israel and that of Benjamin (ib. 1818). , or, according to Zeitlin, ("The Lot of the Just"), by Kalman Kohen Bistritz (Vienna, 1821); Biblical drama in three acts, the hero and heroine being Mordecai and Esther. ("The Remnant of Judah"), by Solomon Judah Rapoport; a free adaptation of Racine's "Esther," in four acts, with an introduction (published in the "Bikkure ha-'Ittim," 1827). ("Ḥananiah, Mishael, and Azariah").by Samuel David Luzzatto (published in the "Bikkure ha-'Ittim," 1875). ("On, Son of Pelet"), by the same author (ib.). ("The History of Moses"), by Isaac b. Saul Kandia (Warsaw, 1829); drama in two acts. ("The Greatness of Joseph"), by Nathan R. Kalkar, in his "Niṭ'e Sha'ashu'im" (Copenhagen, 1834); Biblical drama. ("Boaz and Ruth"), by Israel Jehoiada Cohen (Breslau, 1834). ("The Torrent of Rivers"), by Aaron David Gordon (Wilna, 1836); an allegorical drama in three parts. It is a satire upon the conditions of the time, in which the author flays those who indulge in drinking on the anniversary of a parent's death. He was afterward persecuted by the class at which he aimed his shafts. ("The Trunk of Jesse"), by M. Letteris (Vienna, 1836); a tragedy in five acts, the heroine of which is Athalia. ("The Fall of Sisera"), by Naḥman Isaac Fishmann (Lemberg, 1841); Biblical drama in two acts. ("The Peace of Esther"), by M. Letteris (Prague, 1843); tragedy in three acts. ("On the Walls of Jerusalem"), by Phinehas Kraemer (Vienna, 1865); a tragedy dealing with an episode of the destruction of the Second Temple by the Romans. ("A Virtuous Woman"), by Elias Levin (Wilna, 1866); Biblical drama in one act, the principal characters being David and Abigall. ("Glory to the Intelligent"), by A. B. Gottlober (Jitomir, 1867); an imitation of Luzzatto's "La-Yesharim Tehillah." ("Fable and Satire"), by Meïr Löb Malbim (Paris, 1867, and Warsaw, 1877); allegorical drama in four parts. ("The Fall of Absalom"), by Joshua Bank (Odessa, 1868 and 1878); Biblical tragedy. ("Truth and Belief"), by Ab. B. Lebensohn (Adam ha-Kohen) (Wilna, 1867 and 1870; an allegory in three acts and twelve scenes, attacking superstition. ("Elishah, Son of Abuyah"), the teacher of R. Meïr, who was baptized (Vienna, 1868); an adaptation of Goethe's "Faust." ("Terror of the Nights"), a Talmudic tragedy, the heroes and heroine of which are King Solomon, Asmodeus, and the Queen of Sheba. The subject is the Talmudic legend of the dethronement of Solomon by Asmodeus. This work has not been published (see "Orient," x. 635). ("The Conspiracy of Shebna"), by N. Fishmann (Lemberg, 1870); Biblical drama in five acts. ("Nabal the Righteous"), by A. D. Wechsler (Lemberg, 1874); comedy in five acts, denouncing the hypocrisy of the day. It is an adaptation from Molière's "Tartuffe." ("Hadasa or Esther"), by G. Gitelevicz (Warsaw, 1875): Biblical drama in twelve scenes. ("The Emblem of Love and of Jealousy"), by Aron Margolis (Vienna, 1877); Biblical tragedy, the hero and heroine of which are Amnon and Tamar. ("The Advantage of Wisdom"), by S. Apfel (Czernowitz, 1882); drama in four parts. ("The Russian Emigrant"), by Osias Atlas (Przemysl, 1883); tragedy in three acts. ("Bar Kokba"), by L. Landau (Lemberg, 1884); tragedy in five acts the hero of which is Bar Kokba, leader of the revolt against Hadrian. ("Belief and Enlightening" [Rationalism]), by D. M. Andermann (Drohobycz, 1887); an allegory in five acts; the author imitates Luzzatto.Several other dramas written by Russian Jews have not yet been published. II. Berliner in his (Preface to "Yesod 'Olam," p. xix.) makes the statement that Letteris was the first translator of dramas into Hebrew. But if the adaptations of Letteris are considered to be translations merely, the priority must be given to David Franco-Mendes, of the end of the eighteenth century, who wrote "Gemul 'Atalyah" (The Punishment of Athalia), a Biblical drama in three acts adapted from Racine and Metastasio (Amsterdam, 1770). It was in the nineteenth century, and especially in its second half, that Hebrew literature was enriched by numerous translations of dramas. Meïr Letteris was certainly the first translator or adapter in the nineteenth century. His translations, or rather his adaptions, are mentioned above, namely: (1) Racine's "Esther" into Hebrew under the title "Shelom Ester"; (2) "Athalie," of the same author, under the title "Geza' Yishai"; (3) "Ben Abuyah," an adaptation of Goethe's "Faust." 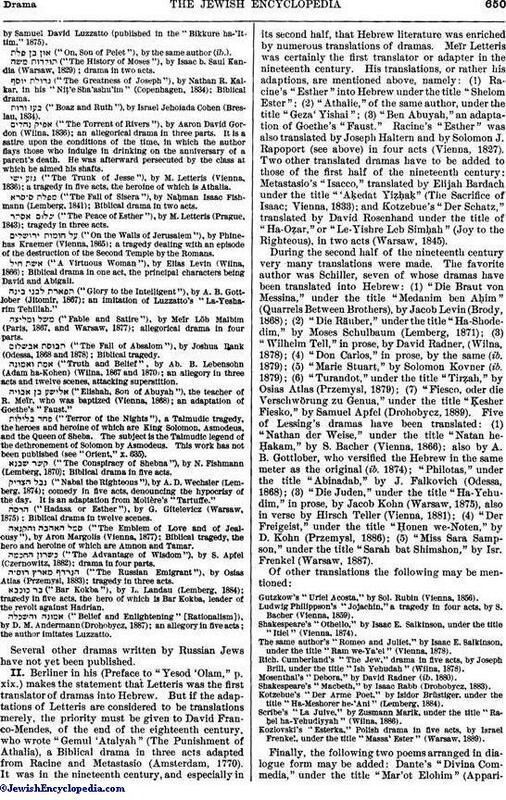 Racine's "Esther" was also translated by Joseph Haltern and by Solomon J. Rapoport (see above) in four acts (Vienna, 1827). Two other translated dramas have to be added to those of the first half of the nineteenth century: Metastasio's "Isacco," translated by Elijah Bardach under the title "'Aḳedat Yiẓḥaḳ" (The Sacrifice of Isaac; Vienna, 1833); and Kotzebue's "Der Schatz," translated by David Rosenhand under the title of "Ha-Oẓar," or "Le-Yishre Leb Simḥah" (Joy to the Righteous), in two acts (Warsaw, 1845).During the second half of the nineteenth century very many translations were made. The favorite author was Schiller, seven of whose dramas have been translated into Hebrew: (1) "Die Braut von Messina," under the title "Medanim ben Aḥim" (Quarrels Between Brothers), by Jacob Levin (Brody, 1868); (2) "Die Räuber," under the title "Ha-Shodedim," by Moses Schulbaum (Lemberg, 1871); (3) "Wilhelm Tell," in prose, by David Radner, (Wilna, 1878); (4) "Don Carlos," in prose, by the same (ib. 1879); (5) "Marie Stuart," by Solomon Kovner (ib. 1879); (6) "Turandot," under the title "Tirẓah," by Osias Atlas (Przemysl, 1879); (7) "Fiesco, oder die Verschwörung zu Genua," under the title "Ḳesher Fiesko," by Samuel Apfel (Drohobycz, 1889). Five of Lessing's dramas have been translated: (1) "Nathan der Weise," under the title "Natan he-Ḥakam," by S. Bacher (Vienna, 1866); also by A. B. Gottlober, who versified the Hebrew in the same meter as the original (ib. 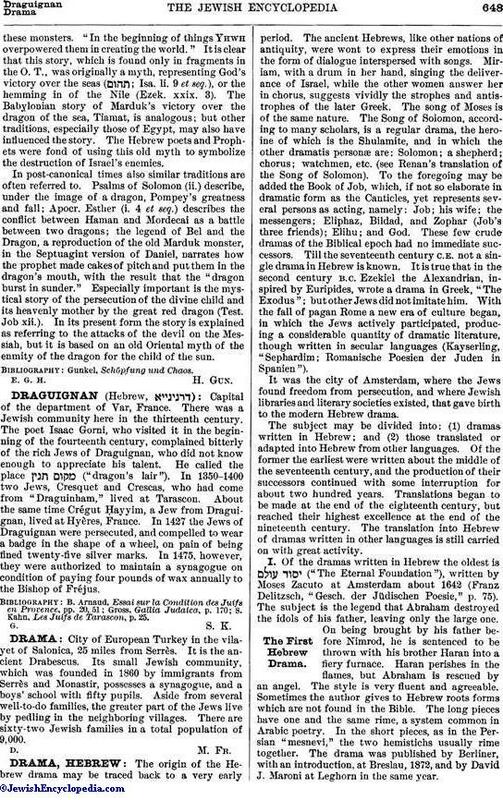 1874); "Philotas," under the title "Abinadab," by J. Falkovich (Odessa, 1868); (3) "Die Juden," under the title "Ha-Yehudim," in prose, by Jacob Kohn (Warsaw, 1875), also in verse by Hirsch Teller (Vienna, 1881); (4) "Der Freigeist," under the title "Ḥonen we-Noten," by D. Kohn (Przemysl, 1886); (5) "Miss Sara Sampson," under the title "Sarah bat Shimshon," by Isr. Frenkel (Warsaw, 1887).Of other translations the following may be mentioned:Gutzkow's "Uriel Acosta," by Sol. Rubin (Vienna, 1856).Ludwig Philippson's "Jojachin," a tragedy in four acts, by S. Bacher (Vienna, 1859).Shakespeare's "Othello," by Isaac E. Salkinson, under the title "Itiel" (Vienna, 1874).The same author's "Romeo and Juliet," by Isaac E. Salkinson, under the title "Ram we-Ya'el" (Vienna, 1878).Rich. 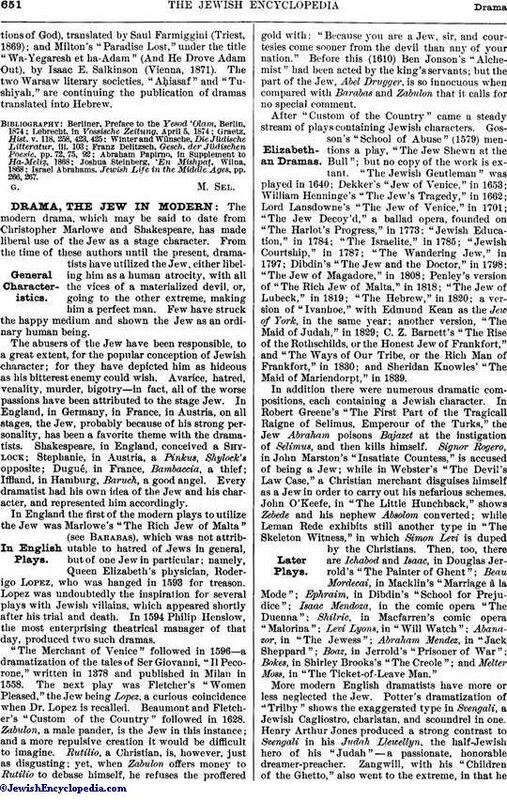 Cumberland's "The Jew," drama in five acts, by Joseph Brill, under the title "Ish Yehudah" (Wilna, 1878).Mosenthal's "Debora," by David Radner (ib. 1880).Shakespeare's "Macbeth," by Isaac Rabb (Drohobycz, 1883).Kotzebue's "Der Arme Poet." by Isidor Brüstiger under the title "Ha-Meshorer he-'Ani" (Lemberg, 1884).Scribe's "La Juive," by Zusmann Marik, under the title "Raḥel ha-Yehudiyyah" (Wilna, 1886).Kozlovski's "Esterka," Polish drama in five acts, by Israel Frenkel, under the title "Massa' Ester" (Warsaw, 1889). Finally, the following two poems arranged in dialogue form may be added: Dante's "Divina Commedia," under the title "Mar'ot Elohim" (Apparitionsof God), translated by Saul Farmiggini (Triest, 1869); and Milton's "Paradise Lost," under the title "Wa-Yegaresh et ha-Adam" (And He Drove Adam Out), by Isaac E. Salkinson (Vienna, 1871). The two Warsaw literary societies, "Aḥiasaf" and "Tushiyah," are continuing the publication of dramas translated into Hebrew. Israel Abrahams, Jewish Life in the Middle Ages, pp. 266, 267.